Can a battery powered patch more effectively deliver cosmetics through the skin? 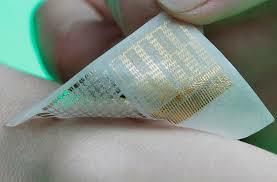 A wearable SoftBattery-Enfucell device has been developed by Spanish and Finnish researchers. It is a paper- thin patch with electronic sensors; the developers claim it will emit micro-currents to increase permeability and faster absorption of applied cosmetics and medications. You can bet you will see SoftBattery-Enfucell technology adopted quickly by anti-aging product producers but first questions have to be answered: How much will the ingredient penetration be and will there be any adverse effects? Is it a device or cosmetic? Will the FDA approve it? Cosmetics have traditionally received little regulatory attention because in the past it was wrongly assumed that such products do not really affect our health and safety. The skin was believed to be a nearly perfect barrier that prevented chemicals applied to it from penetrating the body. This belief went unchallenged until the 1960s, when the much-heralded but unmarketed miracle drug DMSO proved its ability to carry substances with it through the skin and into the body’s tissues and bloodstream. Until it was shown that rabbits’ eyes were adversely affected by DMSO, the drug was being promoted as a through-the-skin carrier of all sorts of medication. It has now been accepted that all chemicals penetrate the skin to some extent, and many do so in significant amounts. Today an increasingly popular way to deliver drugs is “transdermally.” Would-be ex-smokers, for example, can get their nicotine “fix” through their skins by wearing patches rather than through inhaling cigarette smoke. Women can achieve birth control by pasting on a hormone skin patch. There are patches for delivering vitamin C and healing scars. Expect many more “cosmetic patches” to be on the market. The patch method of delivery has caught everyone’s attention. Chesebrough-Pond’s produces strips that remove pore debris. The company reportedly can’t keep up with retail demand. Ponds, at this writing, has two studies examining patches in which ingredients, the company says, can be better controlled through a patch than the usual method of slathering on a skin cream or lotion. Good tests for skin penetration are available, yet are rarely used for cosmetics. Tests to determine the systemic effects or metabolic degradation of a cosmetic ingredient are rarely performed either. Why is this important? Most consumers and the cosmetic companies are concerned with allergic reactions and skin irritations, but what of systemic absorption, toxicity, and chronic effects? What degree of absorption is there when a cosmetic is left on the face (as a makeup base might be for twelve hours) or spread over the entire body (as moisturizer lotions may be)? Is there more penetration with whole body cosmetics than with area applications of cosmetics from a bottle or jar ? What is the exposure to ingredients that may be used for years? Pharmaceutical and cosmetic companies are working right now on carriers –such the electronic battery patch–and solvents for cosmetic products that will help ingredients penetrate more deeply through the skin.